This Layered Sun-Dried Tomato and Artichoke Spread looks complicated to make, so we've included step-by-step photos to prove to you that it's not! 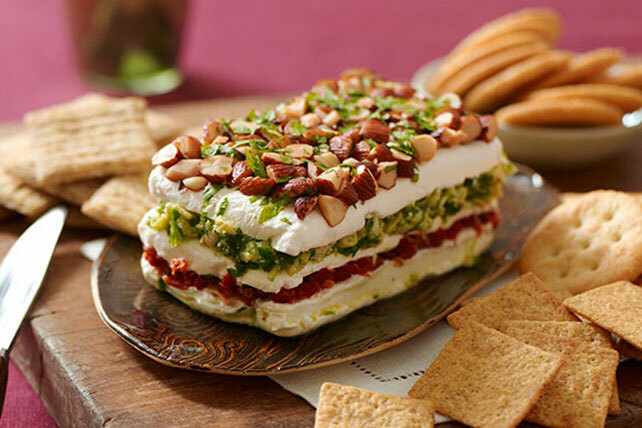 Top with remaining cream cheese slice, nuts and parsley; press nuts and parsley lightly into cream cheese to secure. Wrap with plastic wrap. Refrigerate 1 hour. Serve with assorted cup-up fresh vegetables and your favorite crackers or pita chips. Prepared spread can be stored in refrigerator up to 24 hours before serving. For easier spreading and best flavor, remove from refrigerator about 30 min. before serving. Wrap 18-inch piece of dental floss around bottom third of cream cheese brick, overlapping ends. Pull ends steadily to cut cream cheese. Repeat to make a total of 3 slices.